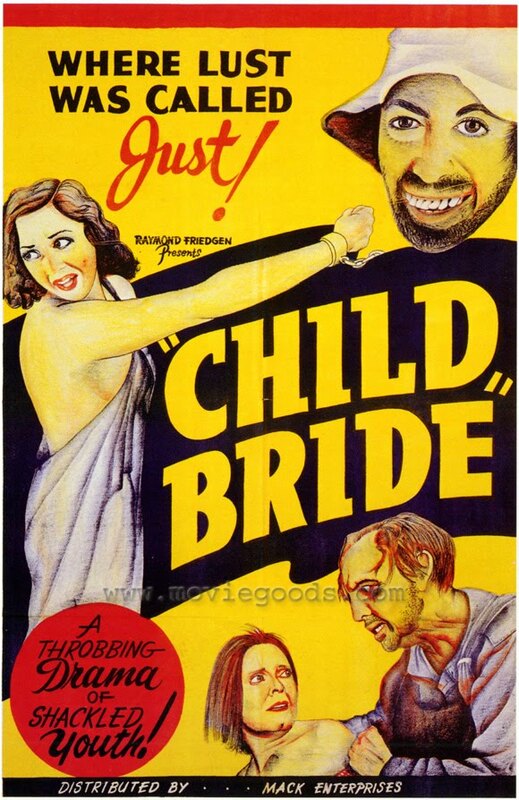 Tonight we have finally uncovered a film so inherently evil, even WE had to censor it: from a world which believes that ten year old fruit are ripe for the plucking comes the 1938 Child Bride. 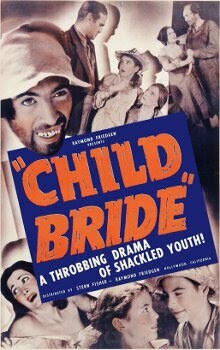 “We aim neither to ridicule nor defend their way of living.” So begins one of the most hateful examples of hicksploitation from 1938, posing as a plea to outlaw child marriage amongst hillbillies - the po' White Trash huddled in mountain communities far away from civilization's disapproving gaze. Popular culture had just discovered these modern primitives with their own customs, a black economy founded on moonshine – yep, these people are dirt poor, with an emphasis on the dirt, and according to Child Bride's litany of cliches, a simple-minded goat milkin', wife beatin', infant lovin' folk emitting a stink worse than the charred, piled-up remains of Lil' Abner, Ma and Pa Kettle and the Beverly Hillbillies combined. At least those folk were cheerfully innocent rubes that even the most unimaginative city drones could feel superior to; no, Child Bride's cast of miscreants are truly ugly people living in a squalid hellhole that God, in His infinite wisdom, has chosen to forsake. One of Child Bride's opening scenes shows a pig wallowing in the mud – shades of the shitstorm to come for ten year old Jenny and her family. Her pa Ira works at an illegal moonshine still with the mean and covetous Jake, a snake with one eye on the till, and the other roaming eye for Ira's daughter. Then there's Angelo the Dwarf (played by the ubiquitous Little Guy Angelo Rossetti), and a simpleton named Happy, a magnificent figure in Gilligan hat and joke-store teeth. They bunk together, work the still, are a kind of mutant Greek Chorus, and are about the most sympathetic characters we're going to subjected to. On the other side of the mountain is the school presided over by Miss Carol, a local lass who'd managed to escape to the Big City for some educatin', but still believes in “my people, my blood”, and is filled with missionary zeal to reform the critters from trading in their poor clapped-out wives in their thirties for a much younger model. Understandably the menfolk don't take too kindly to her meddlin' and putting ideas in the young un's heads, and anticipate a whole mess o' trouble; the womenfolk, all haggard former child brides themselves, are too set in their ways, or browbeaten to even raise an eyebrow in protest. Jake heads up a lynch mob to dispense some good ol' fashioned Mountin' Law, and argue whether to tar and feather the pesky teacher, or boil her in oil. Happy and Dwarfy save her in the proverbial nick, but not before the stage is set for a ghastly tale to unfold of Biblical proportions. So where does this leave young Jenny? Naked, for one thing, and swimming with her German Shepherd under the watchful gaze of her would-be beau Freddy and a peeping Jake. It's at this point the film steps way over the point of acceptability under any circumstances, and was the film was usually sheared of ten minutes' footage by like-minded authorities. If you ever wondered where we at Schlock Treatment draw the line, it's RIGHT HERE. As a result you'll only see a black screen, and please don't let your imaginations fill in the blanks. It's also a black flag for poor Jenny's doomed family, and without spoiling the ending, let's just say, “Do you take this girl-child...” are some of the most sinister words I've ever heard uttered by a man of the cloth. 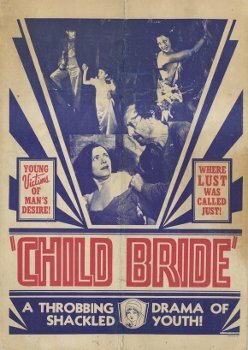 Child Bride is just one example of a peculiar kind of exploitation film from the Thirties and Forties: like the VD scare films and drug horrors of Reefer Madness and co, it's leering, spiteful pseudo-propaganda wallowing in the exact kind of filth it purports to condemn. Sometimes I suspect that we, the Schlock Treatment audience, are just like the pig in Child Bride's opening sequence, wallowing in filth – but then I remember that we are, in fact, that child-like innocent in the Gilligan's hat. 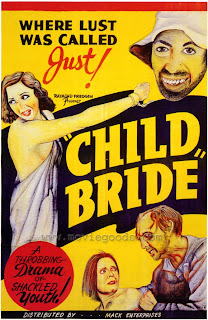 See y'all later, y'all after the 1938 Child Bride.